Dive Journal: Santiago takes the boat to a nearby beach club dock for our surface interval, and after a while Ron gets out the onboard oxygen equipment. He shows us its working parts and demonstrates its use, and we each take a breath of the oxygen, just to try it once. Linda, Janel, John, and I then each assemble, operate, then disassemble the equipment for Ron. This is a part of our Rescue Diver training, which will start more fully tomorrow. Back out on the water, we head to the site called Paseo del Cedral. I’ve added weight and am now carrying 13 lb. Actually more than I want, but a matter of convenience. There’s a lot more current here than last dive, but we still find ourselves finning plenty to keep up with Ron. He’s probably wondering why we are so slow. The stronger current makes the video difficult, as the objects of interest keep sailing by. We spy a small turtle near the entry point, but it’s just a little bit upcurrent from us, and we’re way out of sight very quickly. 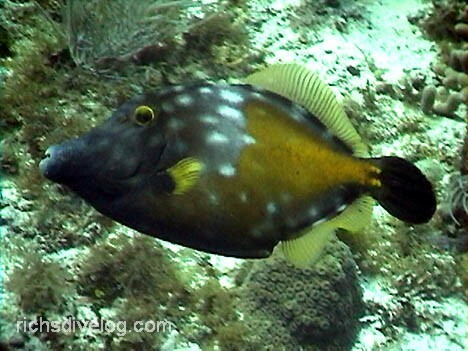 There are some fabulous white-spotted filefish around who virtually ignore us divers. There are some beautiful (but stupid – ask Janel) scrawled filefish that ignore us as well. A handful of medium sized groupers are about, (I’m not sure which variety, possibly scamps), some very large schoolmasters, one huge porgy, and some big schools of grunts. Nearing the end of the dive, we also get a great sighting of 2 nice nurse sharks swimming around. It seems like we cover a lot of distance on this dive, maybe pushing a mile or so. It’s a good thing that Santiago is so experienced at following and finding us. We dock back at Hotel Lorena, and leave our wet gear on the boat. Blue XT Sea has a wonderful practice of stowing and cleaning all your gear, then having it ready for the next diving day. Truly a luxurious service. We have lunch after our diving at Papa Hog’s, a rustic place right next to the Villablanca. Apparently owned by a Harley-type dude, the drinks and eats are good, and we eat outside, enjoying our first full relaxing day on Cozumel. The rest of the day is slow, and we spend it finishing up our knowledge reviews for the Rescue Diver training, and a nice evening walk to the grocery store about 2 miles away. We skip dinner, and instead enjoy some of the breads and cakes purchased from the grocery. The walk is good lazy entertainment for us and the evening stroll is pleasant. The night, however, brings problems. Our new room is immediately adjacent to the street. Anyone who’s ever visited Cozumel knows there are hundreds and hundreds of taxis everywhere. These taxis make it very easy and convenient to get anywhere you want, and the fares are reasonable. However, from our room, you can hear every taxis that passes as they roar by, accelerating away from the speedbumps outside. I spend a miserable night trying to eek out a couple hours of sleep.